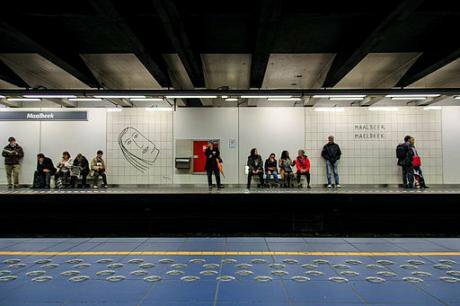 Maalbeek/Maelbeek station, 2012. Wikicommons/ stalebg. Some rights reserved.With the recent capture of Salah Abdeslam, thought to be the only surviving member of the terror commandos of the Paris massacre, the western media has again focused on the threat of terrorist attack in western capitals by so-called Islamic State, ISIS. This morning’s tragic events in Brussels airport and metro shocked the world and created a heightened sense of insecurity, in a similar way to the effects of last year’s Charlie Hebdo terror attack in January and later Paris attacks in November by ISIS. But then, after Paris attacks, the focus of media shifted hastily elsewhere and ISIS became yesterday’s story, as if the terrorist movement had ceased to exist or disappeared into far lands not able to affect our lives any more. In reality, ISIS has never stopped killing people brutally in large numbers since the slaughter in Paris in November last year. It has kept murdering innocent civilians in large numbers, but not in Europe. Just last month in late February, two ISIS suicide bombers blew themselves up in an outdoor mobile phone market in Sadr City, Iraq, killing 73 people and injuring more than 100. On the same day, hundreds of ISIS fighters coordinated a massive attack in Abu Ghraib, on the western outskirts of Baghdad. This was just one day’s news in Iraq. Almost every day in Iraq, Libya and Syria there are terrorist attacks, suicide bombs, and tens, if not hundreds, of civilians murdered, around-the-clock. Almost certainly many more are being murdered right now, as we’re watching the news from Brussels airport in fear. Our part of the world, the western world scarcely notices many of these bloody events because they seem to be part of the natural order in those faraway, and somewhat exotic, lands - Iraq, Syria, Libya and Yemen. There is a disconnect in western minds between the wars in the Middle East and North Africa and terrorist attacks in western capitals. Apart from the psychological help one gets from feeling that many of those scary events are happening in far-off places, safely removed from us, to separate the two is also very much in the interests of western political leaders. Because in this way, they stop their public from recognising that miscalculated and extremely disastrous policies of the US government and its allies in Europe contributed to creating the conditions for the rise of terrorist gangs like ISIS to which Salah Abdeslam belonged. Even some American military leaders now openly express their views that recent terrorist violence in the west is an understandable and predictable response to all the violence and mismanaged interventions delivered by our governments in the Middle East during the last two decades. ‘The Iraq War may turn out to be the greatest strategic disaster in American history. In a mere 18 months we went from unprecedented levels of support after 9-11..to being one of the most hated countries…’, said Lt. General William Odom, former National Security Agency Director. To acknowledge this in no way justifies what happened in Paris in 2015 and Brussels today. Terrorist attacks against civilians are, without any doubt, crimes against humanity whenever and wherever they happen. At the same time, to pretend that western actions since the early 1990s in the Middle East have nothing to do with the current problem of terrorist attacks against western targets is to disregard the obvious and bury our heads in the sand. The emergence of terrorist groups such as the Islamic State or al-Qaeda is an unfortunate but predictable result of decades-long western military interference in the Middle East, which has caused the death of hundreds of thousands, if not millions, of Afghanis, Iraqis, Syrians and Libyans. The west now faces a Frankenstein’s monster, as the violence of IS is increasingly threatening not only the Middle East but Europe’s internal security.